Pygora kids can be “pre-registered” prior to growing in their adult fleece but cannot be permanently registered until their adult fleece grows in – usually between 7-12 mos of age. Pre-registration requires a side view photo of the kid between birth and 3 or 4 weeks of age, a completed application and a small fee. White kids reliably grow in a white fleece, but other colored kids can grow brown, grey or caramel or white fleeces. It’s also difficult to determine with certainty if a young kid’s adult fleece will be an “A”, “B”, or “C” type. 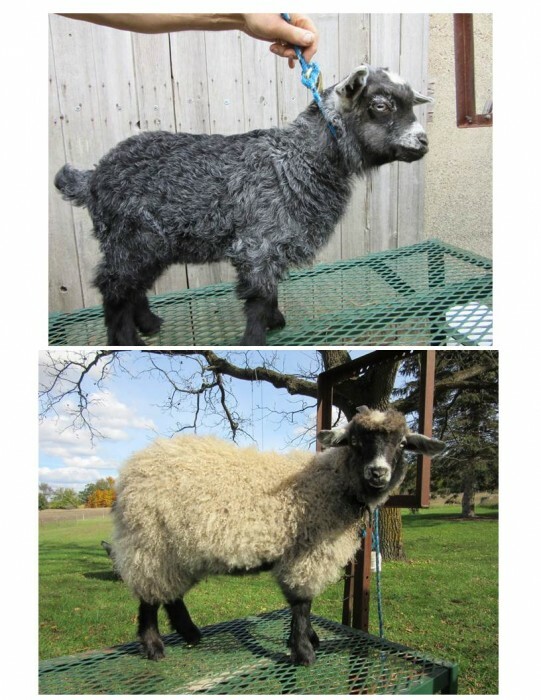 For permanent registration, the Pygora Breeders Association (PBA) Registrar needs a side-view photo of the goat “out of fleece”, a side view photo of the goat “in fleece”, and a fleece sample clipped from the tip of the fiber to the skin, from anywhere along the animal’s side (between the shoulder and hip). Because it can take 6-12 months for a goat to fully grow in their adult fleece, kids born to registered Pygora parents can be pre-registered until the fleece sample and “in fleece” photo can be taken. If a kid has been pre-registered, the original pre-registration certificate is sent in along with an “in-fleece” side view photo and a 2″x2″ fleece sample. If a kid was not pre-registered at an early age, include a registration application, a small application fee, an “in-fleece” side view photo and 2″x2″ fleece sample, along with an “out-of-fleece” (sheared) side view photo. Temperature = 102.5 – 104 – This varies depending on the temperature of the goat’s surroundings. Bucks = 8-10 average age – bucks usually live shorter lives than does and wethers due to the stresses of going into rut each year. Individual animal IDs can serve different purposes, and there are several ways to identify individual goats. Some IDs are used to track goats for USDA/APHIS mandated health tracking purposes, while other IDs are used for breed registries. All farms that breed and sell goats of any type are required to have a herd “scrapie ID number”; these ear tags are available at no charge and identify animals by “farm of origin”, but they do NOT identify individual animals. This type of ID is not acceptable for most breed registries. ID methods for goats include a wide variety of ear tags, tatoos or microchips (transponders). Some ear tags have numbers that are just read visually, others use radiofrequency (RFID) numbers. Ear tags can use a single number to identify a “farm” or have different numbers to identify individual animals. Tatoos or microchip implants are usually used to identify individual goats, with placement in either ears or tails. For Pygora Breeders Association (PBA) registration, goats must be identified individually with either a tatoo and/or an injectable microchip (or transponder). All goats that are microchipped must still be assigned a tatoo on the PBA registration application even if the tatoo is not stamped in, and the tatoo number will be listed on the registration certificate. Pygora Breeders Association registry information can be found here.